When the first trailers for Rogue One: A Star Wars Story began to hit the film was still evolving and going through significant changes. This resulted in several shots appearing in the trailers but not the final film. 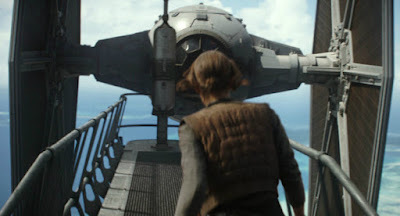 Perhaps the most famous of these shots featured Jyn Erso on the roof of the Imprial complex on Scarif only to have a TIE appear in front of her. Many fans wanted to know what happened next, unfortunately there is no true answer. While a case could be made that the scene captures the spirit of the later scene where a TIE Striker attacks the gangway Jyn is on, injuring her, it does seem wrong to include something in the trailer that they know will not be in the final film. In the same Entertainment Weekly piece Edwards and, the first writer of Rogue One, Gary Whitta spoke about some of the references to previous films that ultimately wound up cut from the film. One of these cut references was that originally the Rebel base on Dantooine would have been seen. Dantooine was the planet Leia told Tarkin and Vader that the Rebel base was located on, only for the Imperials to find out that it had been abandoned. Rogue One would have taken us inside the soon to be abandoned base. (We did catch a quick glimpse at the base on Star Wars Rebels a few weeks ago). “We did a few things to save money and one of them was they go to a Rebel base in the first half of the film, then go off on their adventure, and the second half of the film they return to a Rebel base. It used to be that the first half of the movie was not on Yavin it was Dantooine. Another connection to the previous films that was cut was that Admiral Ackbar was originally suppose to appear. The character would later be replaced by Admiral Raddus, another Mon Calamari general, but the plan was for that role to be filled by Ackbar (though Ackbar would have had to survive, where as Raddus unfortunately probably did not make it off Scarif). You can read the rest of the interview with Whitta and Edwards, where they further discuss some the smaller ideas that were cut from the film, over at Entertainment Weekly.